Beleaguered emerging markets across the globe breathed a sigh of relief Thursday afternoon when the chair of the US Federal Reserve, Janet Yellen, explained that the Federal Open Markets Committee would not (yet) be raising the federal funds rate, expressly due, in part, to weak economic conditions in emerging economies where tighter US monetary policy could exacerbate macroeconomic conditions. When it comes to world politics, the FOMC’s decision could give the strongest boost to the ruling party’s presidential candidate in Argentina, who currently leads polls ahead of the October 25 general election. Many economists argue that seven years of interest rates at the zero lower bound have created a bubble in emerging economy assets. Investors looked to developing economies with potentially higher rates of return outside the developed world while the Federal Reserve was flooding the global economy with liquidity, not just by lowering interest rates to zero, but through several rounds of quantitative easing. It’s already been a tough couple of years as investors have pulled back from developing economies, beginning with the Fed’s decision to begin tapering off from the peak of its QE bond-buying program. But the slowing Chinese economy and depressed prices for oil and other commodities (not, perhaps, entirely unrelated) have made life particularly difficult for emerging economies. By keeping interest rates at zero, the Federal Reserve will lessen pressure on those economies. That’s good news for incumbents who face voters in elections this autumn, including Canadian prime minister Stephen Harper, whose country has increasingly become a leading energy exporter and whose Conservative Party narrowly trails in polls heading to the October 19 federal election. However, Canada’s increasing reliance on demand for energy has meant it has slipped into recession. The FOMC decision could also boost the Turkish economy before voters return to the polls for the second time in six months. Turkish president Recep Tayyip Erdoğan’s ruling Islamist party hopes to restore the parliamentary majority that it lost in June. After years of growth, Turkey’s economy is now slowing amid increasing political turmoil and, like many emerging market currencies, the value of the Turkish lira has fallen by nearly 30% against the US dollar since 2012. But the biggest winner, in terms of global electoral politics, is Daniel Scioli, the outgoing governor of Buenos Aires province and the candidate of the peronista Frente para la Victoria (FpV, the Front for Victory) of outgoing president Cristina Fernández de Kirchner. 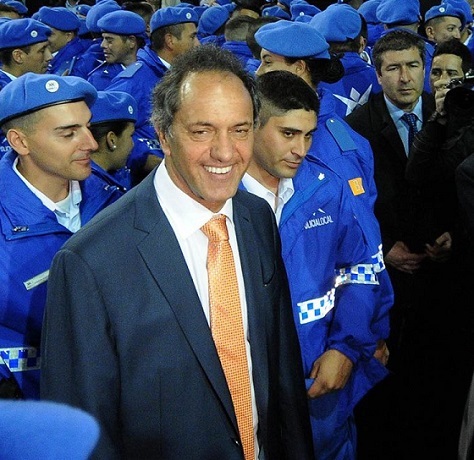 Throughout 2015, Scioli has built support at the expense of Mauricio Marci, the center-right former mayor of Buenos Aires city, and Sergio Massa, the mayor of Tigre and a former member of Kirchner’s cabinet running as a more-business friendly peronista. Higher US interest rates might not have hurt Argentina so much directly, because Argentina is still frozen out of global debt markets and so has not borrowed heavily in dollar-denominated bonds in the post-crisis era. Argentina is, however, tightly integrated into a regional economy that includes Brazil and Chile. The former is suffering not only from the drop in oil prices but from a destabilizing political corruption scandal and a currency that’s fallen 30% in value against the US dollar this year. The latter, too, has suffered from lower global copper prices, and the Chilean peso, like the Brazilian real, is suffering against the dollar. The follow-on result for Argentina is, in effect, less demand for Patagonian beef and dairy and other grain products in the Southern Cone. But the depreciating real and peso are all putting more pressure on the Argentine peso. Though there are capital controls in Argentina, the street value of the peso has followed the trajectory of its neighbor’s currencies. That makes access to US dollars more expensive, it makes the price of imports costlier and risks exacerbating Argentina’s long-simmering inflation problem just when prices seemed to be stabilizing earlier this year. The Fed’s decision not to raise interest rates gives a small boost to the Brazilian and Chilean economies and, accordingly, the Argentine economy as well. While Scioli was already leading in the polls after the August primaries, the Fed’s decision is one more nudge to his advantage. Ironically, then, the US central bank’s actions could extend the Kirchner-era grip on Argentina, notwithstanding the fact that the Kirchners have rejected Washington’s economic and political leadership for more than a decade. Monetary policy makes for odd political bedfellows.